Golden amber color. Confected, sweet aromas and flavors of chocolate orange, cinnamon honey, maple french toast, and coconut flakes with a tannic, vibrant, dryish medium-full body and a peppery, massive, very long finish with notes of muddy buddies, passion fruit gummies, brown sugar oatmeal liquado, and allspice berries finish. Big, complex and honest; drink this rum with good friends. 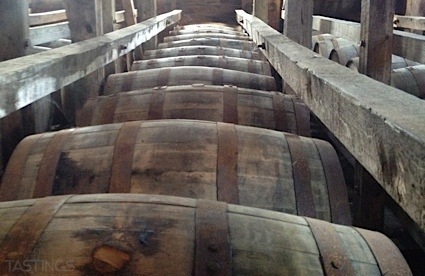 Bottom Line: Big, complex and honest; drink this rum with good friends. 85 • Caliche White Rum 40% (Puerto Rico) $21.99. 88 • Don Q Gran Anejo Rum 40% (Puerto Rico) $59.99. 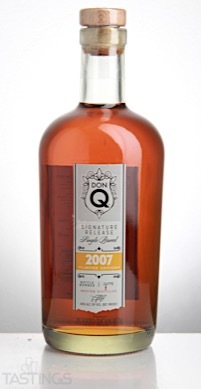 94 • Don Q Signature Release 2007 Single Barrel Rum 40% (Puerto Rico) $39.99. 81 • Don Q Oak Barrel Spiced Rum 45% (Puerto Rico) $29.99. 92 • Don Q Double Aged Vermouth Cask Finish Rum 40% (Puerto Rico) $49.99. 90 • Don Q Añejo Rum 40% (Puerto Rico) $21.99. 93 • Don Q 151 Rum 75.5% (Puerto Rico) $21.99. 85 • Don Q Coco Rum 21% (Puerto Rico) $13.99. 83 • Don Q Piña Rum 30% (Puerto Rico) $13.99. Don Q Signature Release 2007 Single Barrel Rum rating was calculated by tastings.com to be 94 points out of 100 on 3/30/2017. Please note that MSRP may have changed since the date of our review.